Several countries within Southern Africa, including Namibia, Zambia, and Zimbabwe, are aggressively working to eliminate malaria within the decade. The engagement and participation of those living in malaria endemic areas should be a central component of malaria elimination strategies, urged Chris Flowers and Neville Isdell, Co-Founders of the Isdell:Flowers Cross Border Malaria Initiative, a program of the J.C. Flowers Foundation. 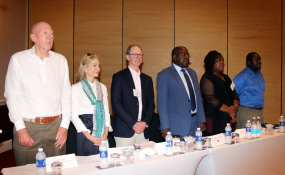 Zambian Minister of Health, The Honourable Dr. Chitalu Chilufya, stressed the urgency of eliminating malaria in Zambia, and the importance of involving communities in the elimination process, during his remarks at the meeting’s formal opening on March 1 st . There has been significant progress towards malaria elimination over the past 15 years: the number of malaria deaths has been cut nearly in half since 2004 (from more than 790,000 in 2004 to about 435,000 in 2017), and 37 countries that previously had malaria are now malaria-free. However, 3 billion people live in places that are still at risk of malaria. The J.C. Flowers Foundation’s Isdell:Flowers Cross Border Malaria Initiative partners with national governments, the Anglican church, non governmental organizations (NGOs), and community members to eliminate malaria along the shared borders of Angola, Namibia, Zambia, and Zimbabwe. The Initiative is comprised of 1,700 community malaria volunteers who provide malaria education, rapid testing, and treatment in places that are beyond the reach of most NGO and even government services. Neville Isdell, Co-Founder of the Isdell:Flowers Cross Border Malaria Initiative and former Chairman and CEO of Coca Cola, stressed the importance of ensuring effective “end to end processes” for malaria elimination – meaning that each link in the chain, from bed net manufacturing, to ensuring a child sleeps under a bed net, needs to be functioning properly. During the 2-day meeting, the Anglican Church pledged its commitment to further engage with communities in the battle against malaria. The Most Reverend Albert Chama and the Right Reverend David Njovu, Bishop of the Diocese of Lusaka, participated in a dialogue at the Round Table around the role of faith in malaria elimination. The campaign slogan, “Zero Malaria Starts With Me” was prominently displayed during the Round Table meeting, urging every individual to take personal responsibility in the fight against malaria. Kenneth Tembo, a fisher from Zimbabwe, exemplified this theme in the story he shared: once he realized the dangers of using his mosquito bed net for fishing, he stopped this behavior and now is an advocate in his community for proper practices to protect oneself against malaria. “If I use my bed net for fishing, I’m digging my own grave, ” he said. Round Table participants, in addition to those mentioned above, included King Mario Satipamba, King of the Onaluheke Kingdom in Angola; Chief Mundandwe of the Mishilundu Chiefdom in Liuwa Plain National Park; Dr. Richard Kamwi, Elimination 8 Ambassador; Anglican Bishops from the Dioceses of Angola, Namibia, and Matabeleland; representatives from the United States Agency for International Development’s President’s Malaria Initiative, The RBM Partnership, the Harvard T.H. Chan School of Public Health, The MENTOR Initiative, Malaria No More, United Kingdom; University of California San Francisco’s Global Health Group, Johns Hopkins Center for Communication Programs, MACEPA, Macha Research Trust, and BASF. Copyright © 2019 J.C. Flowers Foundation. All rights reserved. Distributed by AllAfrica Global Media (allAfrica.com). To contact the copyright holder directly for corrections — or for permission to republish or make other authorized use of this material, click here.